UPDATE: I HAVE A DYNAMIC IP SO EVERY F TIME THE SAME S !!! WELL THE S HAS HIT THE FAN !!!! Last edited by chris on 27 Oct 2018, 04:31, edited 72 times in total. Last edited by chris on 27 Oct 2018, 04:30, edited 33 times in total. Who wants to play? Now really, who wants to join my Coop server ? Anybody ? Is it worth keeping it running ? Where are you people ? Thank you so much for your effort on hosting a game server, but we need more patience in order to meet more player. After thinking a bit i decided to unlock the server list for public view (so anyone on the internet can read this section, even without being registered on the forum). Im sorry but there's nothing i can do at the moment Based on site statistics, the forum have about 10 unique views a day. If you used Discord for once in last year you would see that there are people who care about the game and you would have seen that we have grown a bit. Yeah, my bad because i believed in a forum where i could find people and updates not just old posts. As i knew a forum was meant to discuss, exchange ideas, find new people etc and nobody said "come on Discord, that is where the action is"'. And if Discord is the only place to be, what's the use of this forum ? I really don't get it. Anyway thanks for caring, even if it seems you're the only one it feells a little better now. Costa is forcing this forum because that's the way ppl are finding this community. I can get ppl to play on Discord because they aren't looking on forums. Come on Discord again. We had 2 servers up today. Ok, thank you for the info and for the invite.I'll try. My internet is terrible so we will wait until Costa fixes his old PC. Server hosted on that PC will work 24/7 and it will be posted here in server list. 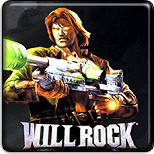 Hey chris i am from Will Rock community also. I specially registered to this abandoned forum to just say to you that the community is active and we slowly grow up. I am by the way a 3D Artist(also i love very much Will Rock game) and already figured out how to make work Will Rock game files so i will be able to port the game on Unreal Engine 4. Community is growing slowly bubt we need all our powers.I am also connected with russian Will Rock community which is count 1500 people. So i think you now already know that lot of people care about game. Nothing is happening in one day.Everything needs time. So not only xxLuckyxx want you come back. I hope you wont go on emotions and give it a chance. Hey MrRubinshtein ! Thank you for registering just for me and thank for your kind words.I needed them so much.I was lost because I love the game so much but I can say that now I'm found ! To port the game on Unreal Engine 4 it will be sick !!! I'm so glad to meet you and I'm so happy that you and xxLuckyxx are here. Peace guys ! Last edited by chris on 27 Oct 2018, 04:35, edited 1 time in total. Hey chris thank you very much for reply. It is very good that you are back and again with us. When you will have time please join back to discord server and we will talk in real time and discuss our future plans and what should we do. I already have progress in ripping models and i am already trying to work on actual game. So i will also show you other stuff in discord. Your profile in discord was offline for long time. Btw, did you try Discord in browser? Thank you xXLuckyXx, maybe I will join hamachi but Discord never again.